As soon as temperatures drop below seven degrees Celsius, it’s time to swap out your all-weather, or your summer, or whatever tires you have on your car and opt for winter tires. In these sorts of temperatures, winter tires are far more reliable, and far safer than all weather tires. We know tires are expensive, so here some convincing reasons why you need to install your winter tires. The main reason that winter tires perform so much better in conditions where the temperature has dropped below seven degrees is grip. Winter tires provide better grip on the road, hands down. As temperatures drop, the road becomes similarly colder, and much harder. Summer tires are made with harder rubber compounds, and two hard surfaces making contact is not good for traction. You need softer rubber in order to grip the hard winter road and that is exactly what winter tires provide. To understand how traction actually works, you have to think at the microscopic level. From a distance, the road, especially if it’s a new, good road, can look pretty smooth and flat. Get up close however, and the surface of the road looks more like a big mountain range, with peaks and valleys and lots of uneven surfaces. In order for your tires to provide you with good traction, the rubber must be soft and pliable enough to fit into the spaces between these surface irregularities as it moves over it, providing grip in the process. When you have hard tires, the rubber slides over the top of the road, instead of squeezing into the uneven spaces in the pavement. 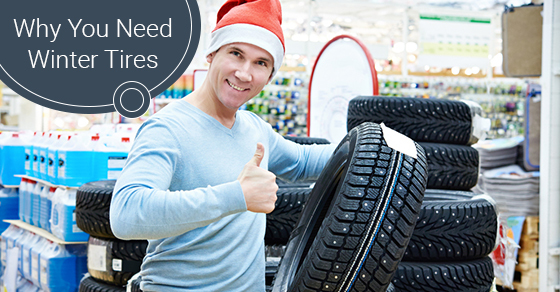 There are a wide range of winter tires designed for specific environments. Some are made specifically for ice and snow driving, for example, while some are better rated for highway driving. What they all provide, however, is increased grip on the road. This becomes doubling important when you factor in the additional moisture of the winter. If you live in an environment that receives a considerable amount of snow, or even a considerable amount of rain during the winter, not only are you driving on a harder, colder road, but your tires are also constantly exposed to moisture. Having the appropriate tires on your vehicle, regardless of the conditions, is one of the biggest things you can do for your family’s safety, your safety and that of other people on the road. If you live in a climate that necessitates winter tires, do the right thing this winter and drive responsibly.